I tried desperately to look towards the horizon. The V-shaped gap at the end of the gorge cupped a dull grey sky. My bottom half was heavy and my nervous knees shook under the extra weight of the nappy harness. I was standing on the edge of a bridge about to jump. A hulking man with an impressive beard started my countdown. Three, two, one…I froze. Have you ever let yourself jump into an experience without knowing what will happen? Without considering the consequences? I rarely do. I evaluate the risks; worry about them and generally put a great deal of effort into a decision before saying ‘yes’. When I travel though, my ability to jump straight in increases. I’m less of a worrier and tend to grasp any new challenge with both hands. To come to South America had been a well-organised and calculated decision; how I would decide to experience it, was not. Roughly twenty of us would spend the next three months together on a self-sufficient yellow truck. As we steadily made our way through mountains and deserts, days on the road would fluctuate from 5 hours to 15. Tents would be dragged out upon reaching sparse campsites and food would be cooked in fading light with the help of our head torches. We had been split into cooking groups and were adapting to the new routine quickly. Lunch duty consisted of erecting a trestle table at the roadside and making sandwiches. After eating, we all stood in a circle, as if about to perform sport stretches, and hone the art of flapping. Flapping, I learnt, is how you dry plates without a tea towel; wafting your arms around in the air holding various pieces of cutlery until everything is bone dry. It was less than a week since we’d left Quito, steadily driving south toward the jungle town of Mishualli and eventually, on to Cuenca, yet already the capital seemed incredibly distant. Days were full with activities, new feelings and ideas that completely swamped my brain. In Baños where the locals bathed in the town’s waterfall and the nearby volcano rumbled threateningly, I learnt basic salsa and practiced it with the locals; I tried new foods and immediately vomited them up while adjusting to my malaria tablets; I roamed markets where I couldn’t identify the items being sold and made new friends of the people who shared my new yellow home. So there I was: somewhere between a small mountain town and the outskirts of the Ecuadorian Amazon, where a narrow road crossed an impressive gorge that roared with whitewater at its base. The previous day when asked if I fancied hurling myself off a bridge into that freezing froth I’d replied with an unequivocal “yes”. Staying true to my word, I approached the team who would harness me up. I now see those few moments standing on a precipice, looking into the distance as a metaphor for my entire time in South America. The decision had been made to jump and despite my nerves and shaking knees I did it. I leapt. 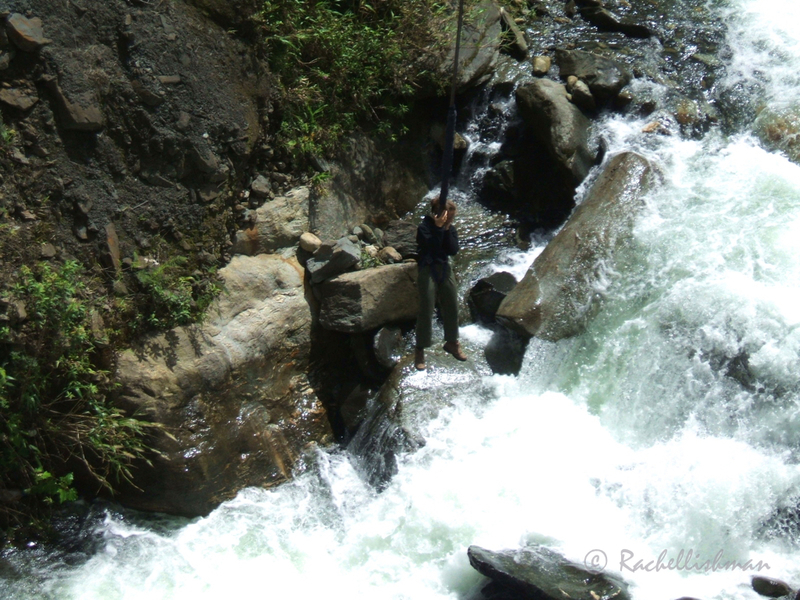 The harness tightened around my thighs as I dropped into thin air but after a sudden jolt I was upright again, swinging in a large arc over the beautiful river and laughing in delight. Within those short five minutes, a few seconds had been terrifying and a few more uncomfortable, but the feeling that endured was elation. I jumped straight in and I was OK. Scary and thrilling, but elated. It took courage and trust and a good harness. 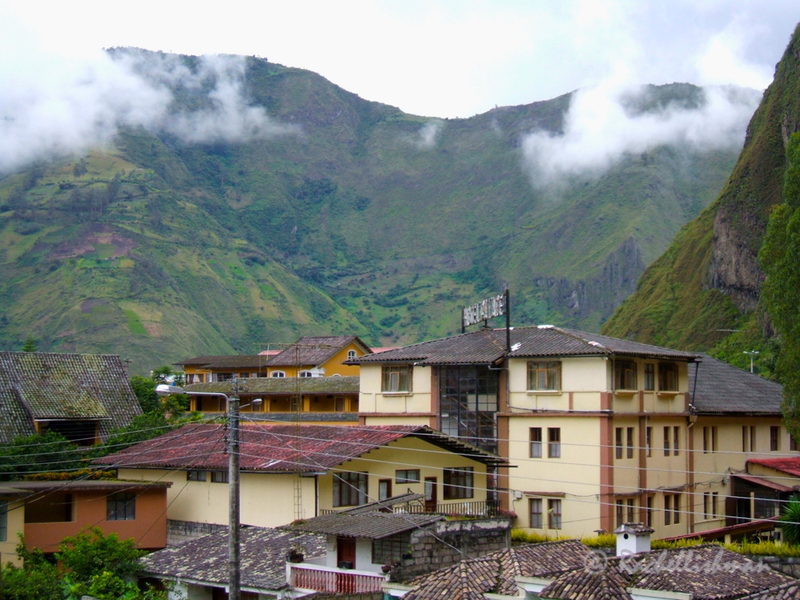 I have been to Banos and stayed at a place with the thermal pools. Cold weather, hot water and incredible views. There was a landslide during the night blocking the main road, causing a lengthy delay for motorists. We watched as machinery worked on clearing it. They seem to be use to it. Likewise Lynne they had just had a landslide further up the road while I was there – as we drove past they were still working hard to clear the last of it away. The place that you stayed sounds wonderful – Banos is definitely a place I’d return to in the future as it’s perfect for ‘escaping it all’! Thanks for your thoughtful comment. You’re welcome Brick – a handy one if you’re camping and travelling very light I guess! You’re very welcome Indah – I love reminiscing about my journeys!